It gets to this time of year and cooking becomes more of a priority. What is about the cold weather and food that make you want to feed everyone all the time. The boys and I are making our way through the Holiday Cookie magazine by Martha, one of my friends sent it to me at this time last year and we have managed to try out a fair few recipes. 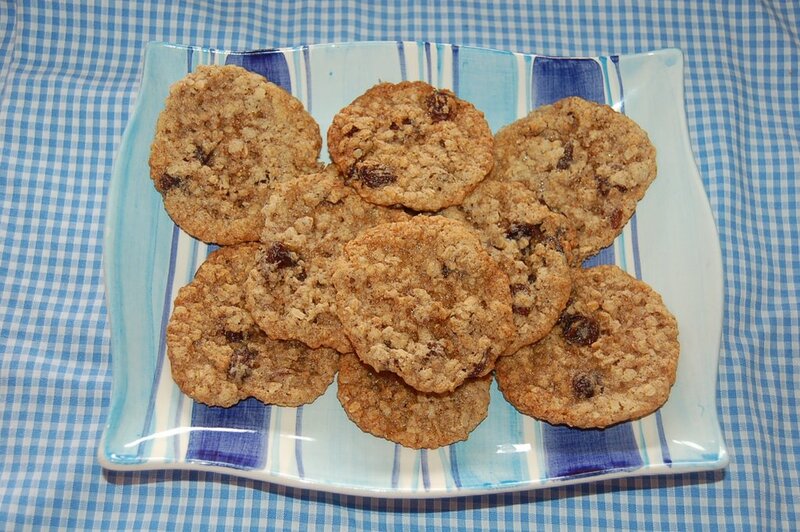 These are oatmeal and raisin without the wheatgerm as I couldn’t find any and with a bit less sugar. 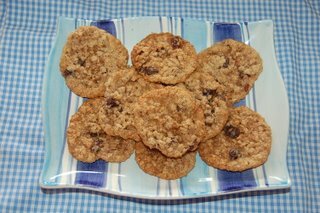 They are very yummy, the recipe makes about 4 dozen so I try and hide some for another day…….. yeah right, its worth a try though!! Today I made an impromptu trip to the yarn store, it is about a 15-20min drive on the highway on a good day, on a bad day it can take forever. It is a mainly plassard store and the lady who works there is very nice. The other yarn stores that are nearer drive me insane, they have the stupid no touching rule and extremely rude staff, so I only go there when I really have to. 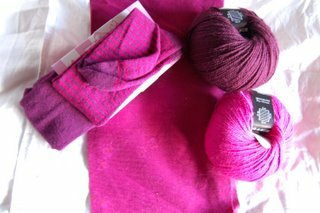 I needed to go to the yarn store to find yarn for a xmas project, it involves this pair of tights, this needlecord fabric and now these two yarns and now you have to wait to see what I can come up with! The colour is a bit more muted in real life but I had trouble getting it right…. Next up a finished pair of socks …Wooot!! The cookies look much more appetizing than my failed attempt! I still have a tin of them left two days later…. What more can I say! You forgot to mention that our lovely wool lady has stopped stocking our favourite “old lady’s hair” taupe mohair. I’m having a wee wake here tonight myself, knitting the last dregs of my last ball into a scarf worthy of that very same wool. How we will miss it…..
Those cookies look nice and chewy, and the yarn colours are gorgeous. My mother’s scarf is back on the needles but for some unknown reason I keep adding stitches, and then I have to try to get rid of them…is this common when you have lots of yarn-overs? Maybe it’s just me. the finished socks are for the other Jamie though… your girls must be fussier than my boys they eat cookies whether they are burnt, bad or just plain yucky. If you are knitting a lace pattern keeping track of yarnovers can be a problem. The cookies are chewy, very good, there are just a couple left this morning. No touching!!!! Are they some sort of weird non-knitting yarn shop owners??? It’s all about the touching! Definitely well worth the drive for some touching…. and those colours are gorgeous.